This Mercury air mover has a top drying speed of 1500 CFM. 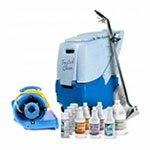 It is great for drying floors and carpets. With a max amp draw of 5 amps, you can run multiple units off of a single electrical circuit. If this unit is not specifically what you're looking for, please feel free to look at our full line of carpet drying fans.